The 2011 Track World Championships open in Apeldoorn, Netherlands tomorrow afternoon, and Canadian Cyclist arrived today in time for the last practice session before racing begins. The Canadian team was on site making their final preparations, with the riders practicing standing starts, and the team pursuit and team sprint squads had one last chance to hone their technique. The Canadian team also announced the final selection for the women's team pursuit squad - Tara Whitten, Clara Hughes and Laura Brown will race the qualifying round on Thursday, with Steph Roorda in reserve. "The fact that we are now in a position to choose the best athletes on the moment shows a lot of strength and depth in Women's Team Pursuit in Canada. It's always tough when a rider is left out, but it is great to see new blood in the team," said Richard Wooles, head coach of the Canadian Track Cycling team. 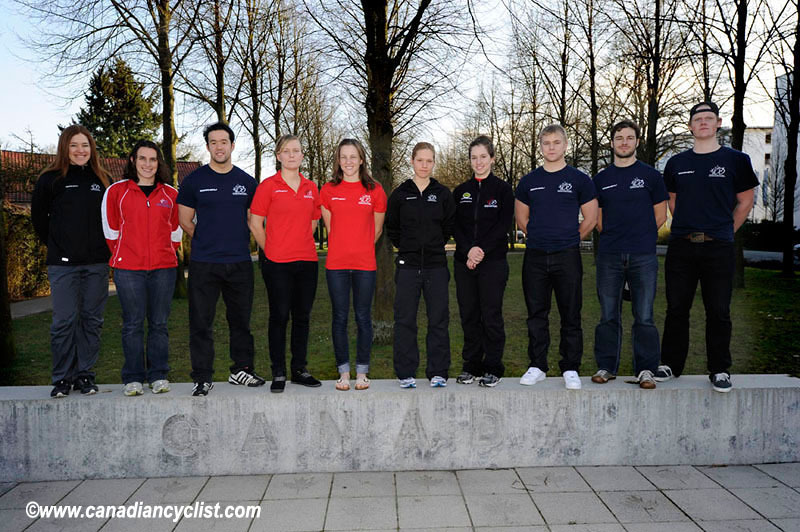 "Clara Hughes' selection to the starting order brings in a new dynamic and an unknown quantity; we are all excited to see the team compete at the upcoming World Championships in Apeldoorn." Wooles explained that, with Whitten a given for the squad, the other three rode a full 3000 metre pursuit two days ago to determine the selection. "It came down to the numbers, it was pretty clear to everyone who the squad should be." "We are currently in a position where we never have been before. Conducting time trials prior to a competition in order to select a team is certainly a great situation in which to find ourselves. This is one of the many signs that testifies to the strength of the Canadian track program led by Richard Wooles," said Jacques Landry, High Performance Director for the CCA. "The four women that vied for a spot on the World Championship squad are all elite athletes with the potential and the ability to compete successfully at this high level." Wooles also said that Canada now has the opportunity to substitute a rider for the medal final if it could improve performance. "All the riders in the program know that this gives them the opportunity to compete during the championships, so it keeps their motivation up." For this reason, the team decided not to enter Roorda in the Points Race tomorrow (Whitten will not defend her title, saving her energies for the two Olympic events - Team Pursuit and Omnium. The 2011 World Track Championships also signals a return to competitive cycling for Clara Hughes. Her last major cycling race dates back to the 2003 Pan American Games, but she feels her progress has been steady, and sees the World Championships as an opportunity. "As the saying goes, it's just like riding a bike, albeit faster and a little bit more stressful with no brakes and in the team pursuit formation. This is a new event for me and it's been awesome learning the nuances of it from Steph, Laura, Tara and Coach Tanya Dubnicoff, as well as Head Track Coach Richard Wooles," commented Hughes. "Because I have so much experience with the team pursuit in speed skating, I seem to be picking things up quite fast and this is really motivating. The National Team has been very generous with their support and encouragement since I have returned to cycling and this I am also grateful." Landry pointed out: "Over the past few years the track program has gained some considerable momentum under the guidance of Richard Wooles. 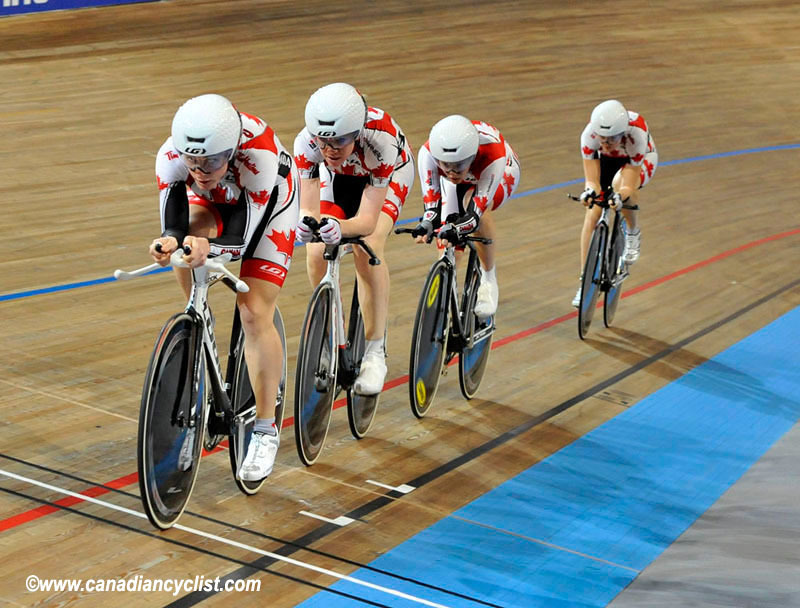 Because of this momentum we've been able integrate additional talented athletes that have contributed to raising the bar, we've hired Tanya Dubnicoff as Women's Team Pursuit coach and have been able to increase our funding for the track program as a whole. All these components that contribute to a solid system have led to our recent performances and the ones to come in the near future. We are definitely on the right track! No pun intended...."
Canada's competition opens tomorrow afternoon (local time) with the Men's Team Sprint, where Canada will have a young squad entered - Thomas Hums, Scott Mulder and Hugo Barrette. Other events on the schedule (no Canadians) are Men's Team Pursuit, Women's 500 Metre Time Trial, Women's Points Race and Men's Scratch Race.